are those 3 browsers the fastest for FOE ? @shad23 You'll just have to experiment with different browsers. Even though I have the same operating system as my friend we still get different results as to which is faster. Yep, the html5 version needs to be fixed to be at least as fast as the flash version. Right now it's not really an alternative to the flash version, as even the simplest things take at least three times longer on a machine that is not high-end. I wasn't patient enough, and gave up after 5 minutes of waiting. Yeah. I wouldn't call that playable. While with flash, it works just fine. Yes, it is no picknick yet an other reason to give up on GvG. Well, if Inno really ditches the flash version by the end of the year, then they have their work cut out for themselves for this year. They've been working at the html5 version for quite some time, and it's still very far from the flash version. I tried HTML5 this morning, city loaded much slower and lost a lot of control moving around my city. I'm using K-Meleon as my browser and windows 8. I have been playing FOE for over 6 years and it would be very difficult to continue if HTML5 was the only system available. Does anyone have any suggestions? Specs are nearly low end for today games' standards, but HTML5 version of FoE runs perfectly smoothy. 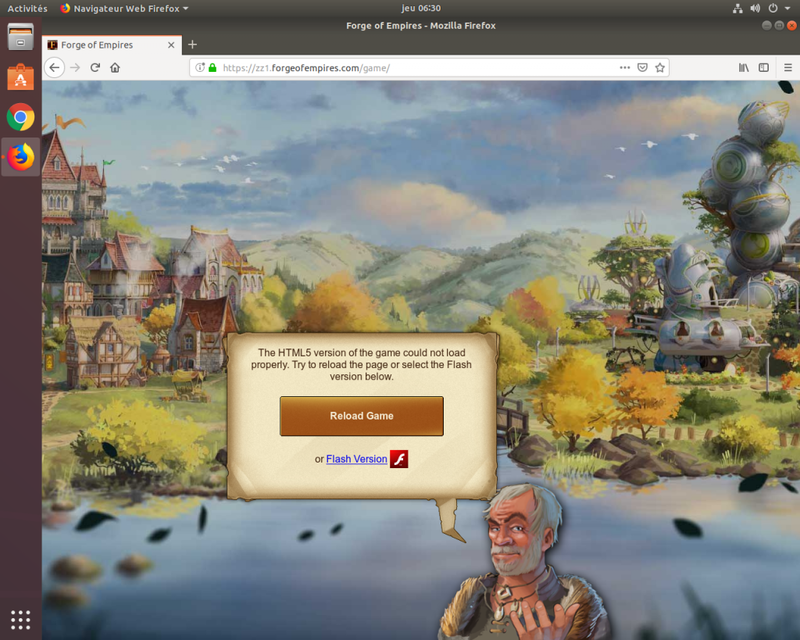 What I also like is that, when I switch tabs in Chrome while running FoE via HTML5, FoE tab doesn't need refreshing after some period of tab inactivity, which isn't the case with Flaah. With Flash, 30 seconds on another tab is enough for game to freeze and page needs to be refreshed. Having read the various comments on both of the relevant threads, I can see where most of you are coming from. Buying a newer PC would be ideal for the Game but not the pocket. Alienware would be wonderful to have but £3.5k for a good gaming laptop is a tad prohibitive for the majority of people, myself included. Perhaps a few £/$s on some faster memory modules would act as a stopgap until the coders get up to speed but obviously not for everyone. I'll fire-up an old test rig of mine later tonight and if I make any worthwhile progress, will post. I doubt that any single core CPUs will be able to cope but dual core with decent memory really should suffice, depending on architecture and BIOS of course. Forced evolution is simply a price of advances in computing, as you are, no doubt, already aware. Alienware is paying for their branding and advertising costs more than anything else. It is really paying for a prestigious name. Better build your own or ask your neighbor’s nerdy kid to help. Don't forget the pretty lights too. As it happens, I've been designing and building systems for 30 years or more, hence the test rig reference, so it really isn't an issue for me. I know not everyone is in a position to do much of the work themselves but swapping out memory for some higher rated modules is an easy option and far cheaper than a replacement machine. Obviously, over-clocking of older machines is risky to say the least. Obsolete Tech is being forced out of use and there is nothing to do but keep up with the curve or lose functionality. I'm in the middle of the second round of testing but I hold out little hope other than to advise a dual core CPU as an absolute minimum requirement with as much good quality memory as the m/board can handle and an up to date BIOS. We will all simply have to learn to live with the situation as best we might. Well that took longer than I expected. The oldest CPU I have which handles HTML5 without any problems is a Pentium B960 @ 2.2GHz, 2200MHz, Dual Core. I dropped in 16GB of Corsair DDR II RAM (top end quality) and set 18.2GB Virtual Memory on a 1TB/12GB Hybrid Drive to help avoid bottlenecks. I ran Win10 Pro and Edge, all with latest updates. Best I could do in a short time and limited stock of available components. Not ideal I know as very few people will be set up to simply grab bits off the shelf or out of the back-room. I do expect that many Players will have Dual Core CPUs so, at 2.2GHz which is old and slow by todays standards, or faster, one should be able to handle HTML5 without too much trouble so long as RAM is decent quality. Memory modules are the least expensive speed boost and easy to swap out. Inno's coders should have matters sorted out in a reasonable time frame. I'm afraid that 's about all I can advise right now but I will have a chat with a couple of friends to see if they have any pertinent input and will post if they do. A little bit of Gen which might help some Players, that I found in Game Settings; if any wish to continue with Flash it is usable in IE, which most will find with a quick Search of their own PCs. Not a panacea but, may act as a temporary work-around. No IE on Linux. Luckily, flash is still usable, hopefully till the end of the year. That should give people enough time to decide how to proceed. Actually, if Inno decides to stop allowing the flash version, it will no longer matter if you can physically run it or not.